Shipping with KitKat may just be the most stimulating aspect of the Excite Go. That 7-inch screen comes with a painful 1024 x 600 resolution. The device is powered by a quad-core Intel Atom processor, and there is 8GB of internal memory to work with (supplemented, thankfully, by a microSD card slot). It won't be the peppiest tablet in the store when it hits shelves in early July, but at $109.99, you could get two for the cost of a Nexus 7. The teenager in the house will scoff, but at least the kids will be happy. 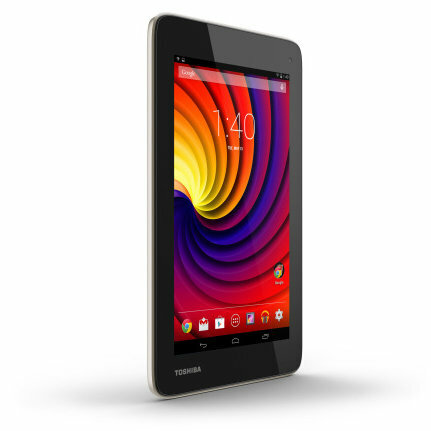 IRVINE, Calif.--(BUSINESS WIRE)--Toshiba’s Digital Products Division (DPD), a division of Toshiba America Information Systems, Inc., today unveiled the Excite Go™ tablet, a seven-inch Android™ 4.4-based tablet that offers a comprehensive and reliable tablet experience at a fraction of the cost, starting at just $109.99 MSRP1. With all the features needed to enjoy convenient web browsing, apps and entertainment, the Excite Go is an affordable option for people looking for an easy-to-use, highly mobile tablet. Encased in a stylish Satin Gold finish, the Excite Go is light and compact, weighing just 12.5 ounces2. It is designed to be comfortably held with a single hand, making it perfect for gaming, reading, emails and more. The tablet’s capacitive multi-touch display features 1024x600 resolution, which provides clear, precise navigation for browsing the web and playing games. Armed with a quad-core Intel® Atom™ processor3, the Excite Go offers high-speed performance for apps and games from Google Play™ and watching videos. 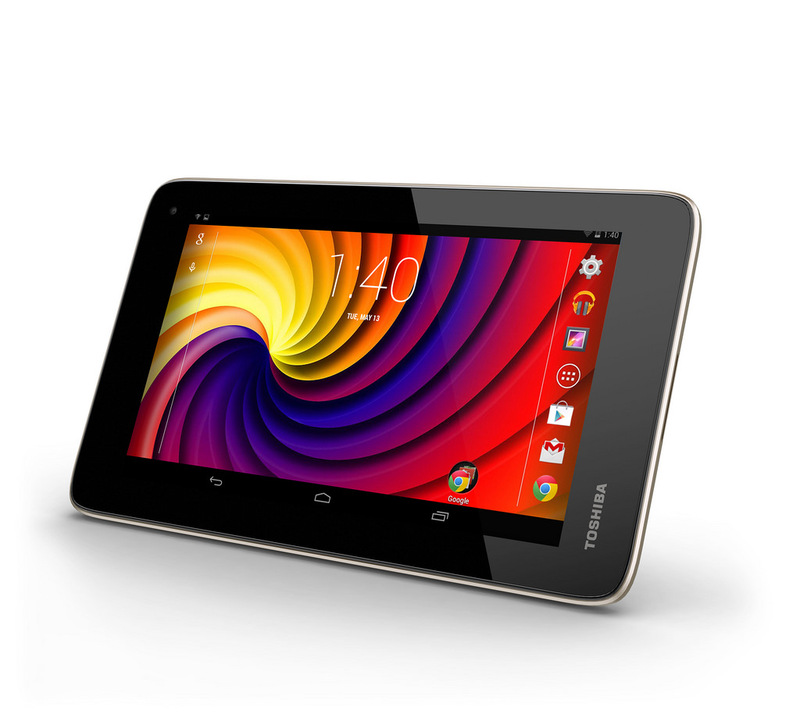 Android 4.4, KitKat allows faster multitasking and improved file management with easy access to Google Drive™ and other cloud storage services. With wireless display support, users can stream even copy-protected premium content on the tablet directly onto a TV screen. The Excite Go also comes pre-loaded with a full version of OfficeSuite Pro (a $14.99 value), enabling portable productivity and the dual camera version includes Toshiba’s exclusive TruCapture™ app that improves the readability of images from whiteboards and books by automatically removing borders, straightening distortion, reducing glare and noise, sharpening and brightening contrast – ideal for classrooms and offices. A single charge on the Excite Go provides up to 7.5 hours of general use or up to 6 hours of video playback4. Additionally, the Excite Go comes equipped with up to 16GB of internal storage5, a Micro USB port and a microSD™ Card slot capable of supporting 128GB SDXC cards, enabling consumers to extend the tablet’s storage capacity. The Excite Go will be available for purchase for $109.99 MSRP beginning in early July at select retailers and on toshiba.com/us.